Safety | Fit Girl. Happy Girl. As many of you know, I’ve just moved to a new city to start my job at Runner’s World. I haven’t been able to blog much mostly because I’ve been so busy at work (which is great!) and I’ve been trying to get settled into my lovely, new apartment. However, of course one of the very first things I did when I had a second was to try out some new running routes. Being in a new city, I think running is one of the best ways to explore a new neighborhood (as long as it’s a safe neighborhood). So, last Saturday morning I set out to do just that- explore my new neighborhood via running. I had a vague idea of where I was in comparison to some run-able roads but I was still getting used to the area. I pride myself on having a pretty good sense of direction so I figured I’d be fine. My new city has a really cute historic area in the downtown part so my goal was to get there, run over a bridge and turn around to head back. I figured it would be about 4 miles. Well, a mile into my run I was lost and standing next to a highway. What? I thought I went the right way and made all the right turns. Apparently not. Usually I’m good about mapping out my runs ahead of time and planning my route but I wanted to explore (and I don’t have Internet in my apartment yet) so I thought I’d let my legs do the mapping. As I stood in front of the highway, completely lost, I thought the only thing I could do was turn around and head back. On my way back I found the street I should have taken a left onto instead of going right. Duh! So, I headed down that street right into the downtown area, my original destination. Map out your route- I like to use the Map My Run web application. It’s super easy and lets you map out a run and calculate the distance. Bring a phone- I know it’s annoying but if you do get lost or into a sketchy situation you need some way to get help. You can get a SPIbelt or a phone armband to easily carry your phone with you. 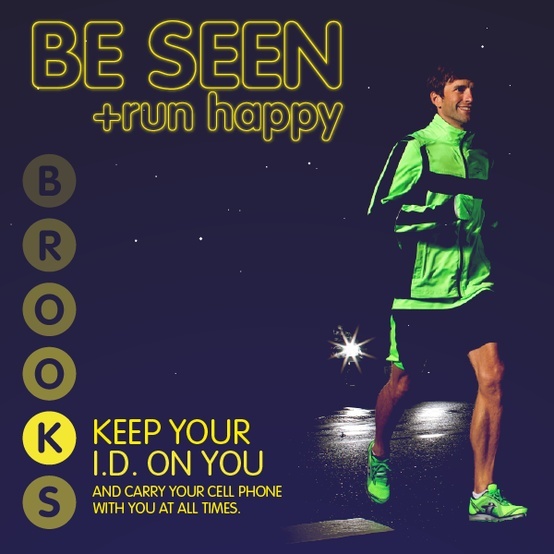 Wear bright colors and/or reflective gear- countless runners get hit by cars every year and it’s not always the fault of the driver. So, be safe and make yourself visible! Don’t wear headphones- people might hate me for this one but I think headphones can be extremely dangerous on the road. You lose your senses and can’t hear if a car is quickly approaching. Run against traffic- for the love of God run on the left side of the road facing traffic! You need to see what’s ahead of you and running against the traffic will help you with this. For my ladies out there, if you’re running in a sketchy-ish area, it doesn’t hurt to arm yourself. I have friends who actually run with a mini can of mace just in case they get in trouble. Use your head- when in doubt, use common sense. If a path looks really lonely, poorly lit or just plain sketchy, don’t run down there. We all love running but it’s not worth your life. Did I miss a safety tip? Tell me about your safety tips in the comments section below!